I'm trying to assist one of my 1Password for Teams users who just installed v6 (first time 1Password user). When we went to install his browser extension we were directed to a page that started downloading the Safari extension (this on IE11 on Windows 10 1607). Okay, so we cancelled that but were unable to find an IE11 browser extension available for download. I know 1Password v4 included the IE extension in the installer. Does 1Password v6 not do this? How do we get the IE extension installed then? I am sorry for the confusion! There is no 1Password 6 browser extension for Internet Explorer at the moment. Since Internet Explorer doesn't have a modern web extension APIs, we can't reuse our extension code easily like we can for Chrome, Firefox, or other browsers. We have to build it from scratch and it would be a great thing to do, but right now we are focused on bringing 1Password 6 to parity with other platforms. I hope for your understanding. Is there a specific reason why you are using Internet Explorer exclusively on your Windows PC? Thanks in advance! Yes, there is a reason. I assume 1Password for Teams was developed primarily with businesses in mind. You should be aware that most businesses have a significant amount of "legacy" application infrastructure that still require Internet Explorer to access and likely will for some time. This is why IE11 was included in Windows 10... it isn't going away anytime soon and to fully adopt 1Password I definitely need the browser extension for auto filling/capture. As much as I'd love to give you better news, a new 1Password Internet Explorer extension for 1Password 6 is most likely not in the cards. Greg already explained some of the technical reasons behind it and Microsoft itself is planning to phase out Internet Explorer sooner rather than later. Is there a possibility for the users to run Firefox or Chrome? I hope this is the right thread to which to pin an additional comment. This morning, Windows 10 lured me into trying Edge. I have to admit it's a nice UI, and I'm all about good UI and UX. Chrome is my go-to browser on both Mac and PC, but I'm willing to expand my horizons. Meanwhile, the question du jour for me is: Is there--or will there be-- a browser extension for Edge? Thanks, guys. 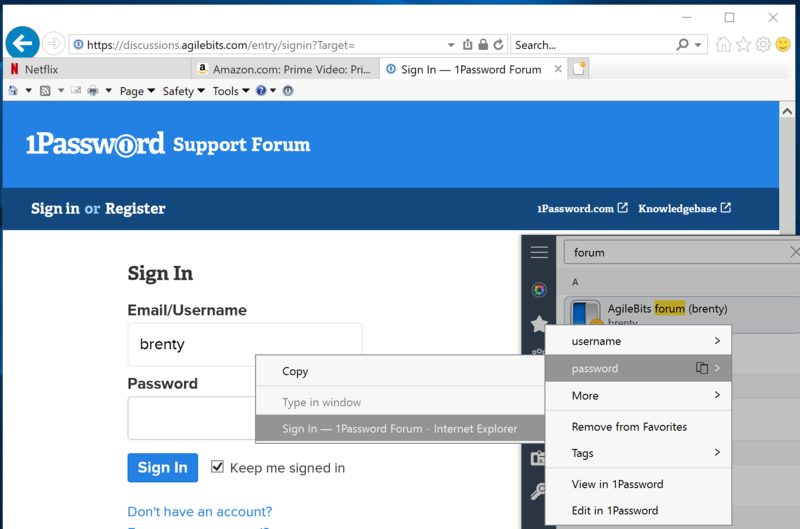 Yes, we want to bring 1Password to Microsoft Edge but there are significant technical obstacles that need to be overcome before it can become a reality. As it stands right now, we don't know when a Microsoft Edge 1Password extension will be available. Still no word on a Microsoft Edge 1Password extension? @ladybooknut: This discussion is about Internet Explorer, but you can find the current information on Edge in the announcement in this forum category — and I'm sure we'll have more to share in the future. Cheers! Okay, it's been nine months and the original complaint still stands: if you visit the downloads page with IE, it tells you it's downloading the extension for Safari. Can you maybe practice a little more honesty and immediately tell people visiting that page with IE that there is no extension for IE? @jpallas: This isn't a matter of honesty. Internet Explorer doesn't support extensions of any kind; it uses its own proprietary add-on format, and these cannot be installed from websites anyway. We don't direct Internet Explorer users to that page. It offers an extension based on the browser's user agent string. We'll see if there's a way to better detect IE there and perhaps put up a ,notice of some kind but I think it would be more helpful if we figure out why you're ending up there in the first place. Are you following a link from somewhere that suggests that there's an IE extension for 1Password? I wonder if there's some mistake. Please let me know! @brenty Here's the sequence my wife followed. Using IE, she went to 1password.com, and clicked on the Downloads link under "Find out more". That led to the Downloads page that had download links for the apps, as well as the message "Get 1Password for your browser" with a big purple button-shaped link labeled "Download browser extension". Clicking on that button resulted in the download for Safari. That seems to be the right place to go to download/install the Firefox and Chrome extensions. No, probably nothing specifically suggested that there was such an extension for IE, but isn't it reasonable to assume that a product supporting Windows supports IE if there's nothing explicitly saying otherwise and the previous version (v4 for Windows) did work with IE? Thanks for writing that, we'll look into adding a note that IE isn't supported with 1Password.com. reasonable to assume that a product supporting Windows supports IE if there's nothing explicitly saying otherwise and the previous version (v4 for Windows) did work with IE? Absolutely, It is reasonable. We just needed to know the path of getting there, so we can prevent that page from showing up in the first place, the user agent isn't enough. 1Password 4 didn't have a separate extension for IE, it automatically installed the plug-in for IE by default, so people don't have to do anything, there were no separate pages or anything like that. Thus, for 1Password 6, we need to add something that wasn't there before. As for Windows products, Microsoft itself doesn't market IE anymore since Windows 10 was released a few years ago, they're only focused on Microsoft Edge. We are working on adding support for it as we've just started testing it recently with the public and plan to update the extensions page to point out the Edge support. I understand that you folks have no control over what Microsoft does, but I'd advise you to think realistically about the vast number of people (like my wife) whose corporate-managed laptops are still running Windows 8, which will never support Edge. Note that Microsoft is scheduled to offer extended support of Windows 8 to paying corporate customers until 2023. We do understand and we're not actually adding support for Microsoft Edge because it's the newest version or anything like that. First, Microsoft Edge is following the same extension model as Chrome, Firefox, Vivaldi, and so on. We are able to support Edge quickly because we can reuse almost everything from our 1Password extension for Chrome. For us to build support for IE, it requires building a new piece of software, replicating the entire codebase of 1Password extension in a different tooling that we don't use and we can't port it from 1Password 4 either because 1Password 6 is different from it. IE has nothing in common with any of the browsers and that's why it is not available at the moment but we may add support for IE down the line. Lastly, we support Windows 7 and above, so we do understand that we're not supporting the default browser on Windows 7 and on Windows 8.1. As for the numbers, Windows 7 owns almost half of the market share, Windows 10 following after that with Windows 8.1 owning less than 8% based on the last numbers we checked. We do try to support the most commonly used browsers and on Windows, that's Chrome for us. Hi there - I was on a trial version of lastpass but found the experience to be frustrating so just signed up for 1password instead. I am trying to get set up and was having trouble getting the add-on set up for IE (v11). I then saw this thread. My question for AgileBits is how come LastPass has an IE add-on but 1password is unable? I feel like I have to be doing something wrong.. surely there is support for IE? Just now to post this, I had to sign in and LastPass (which I still have installed) offers to save my AgileBits password and ID, but no offer from 1password. Please tell me I'm just doing something silly or missed something. I try use Chrome but there are still times when IE opens automatically (like if I click on a link from evernote). Just to add to this.. I then created my first login in 1password and when I go to launch the URL, it launches IE even though in my LP Browsers settings, it only shows Chrome (paired). Even when I try to not use IE, the LastPass application launches IE, which you don't have an add on for. What am I doing wrong? Thank you for reaching out and giving 1Password a try! 1) Open 1Password mini by pressing Ctrl+Alt+\ on your keyboard. 2) Find the item you need there and right-click on it. 4) Paste it in IE. Please let us know if it helps. Thanks! Thanks for the comprehensive response Greg. I changed my default and this should help a lot.. i will give 1password a shot! On behalf of Greg, you are welcome. If there is anything else we can do for you, please let us know. If you just fixed auto-type, this would barely be an issue. Bringing back Auto-type in the new version of 1Password for Windows is definitely on our list. We are taking the first steps in that direction in our alpha-version of 1Password 7 for Windows, so please check it out if you are interested. Thank you! Hi staff of 1Password, its not true that IE don't work with extensions anymore because Roboform give an very nice toolbar. Is it not possible to do that for 1Password too? We didn't say IE doesn't support extensions or stop supporting it, we said it doesn't use the same Chromium-style extension model that all modern browsers use. BHO is nothing like your standard modern browser extension and doesn't work the same way. We actually built one for IE with 1Password 4 for Windows but it is not something that we can reuse for 1Password 7 because 1Password 7 is a completely different product and we have to build a new BHO for IE, we have no plans to do this right now. it uses its own proprietary add-on format, and these cannot be installed from websites anyway. @PeterVisser: I apologize for any confusion I caused. As I just upgraded to 1Password 7, I was frustrated to learn that IE has no browser plugin. As someone mentioned above, MANY line of business apps and websites (including many/most of Microsoft's own Partner Network sites) require IE to be used still (they don't even work in Edge). I'll have to frustratingly go back to copy and paste, when I've happily been using 1Password 4 with the IE plugin for a few years now. I get that it's a struggle, but we still use IE very very frequently (even though my primary browser is Firefox). Just right-click the login in 1Password mini (Ctrl Alt \) to select it. I hope this helps! I just subscribed to 1 pass for the 30 day trial and you guys are so close to to having it all. Not having IE is a big issue. RoboForm who can fill windows apps pretty well has IE, but its interface hasn't improved and they dont' have android app to site mapping like Lastpass does. Lastpass doesn't have a good windows app filer, you guys have a great windows app filler. "We do try to support the most commonly used browsers and on Windows, that's Chrome for us." 1Password will not make anything for IE. Its chrome for you guys, but for corporations its IE because of GPO & Home Grown Apps, Firefox for Java based apps, and Chrome for everything else. It is a great product and you imported lastpass's information way better than roboform did imported lastpass, though the roboform import leaves much to be desired and you leave the roboform import from lastpass in the dust. Thanks for sharing your honest impressions. We think 1Password is pretty great too, and also see plenty of opportunities for improvement. I'm sorry if it's not a good fit for you and some others because we are not supporting Internet Explorer going forward since Microsoft made it clear before we even started building our new Windows app that it was the past and not the future. I hadn't really thought of it in terms of Windows/Chrome since I use plenty of other browsers on my PC in addition to that...but in light of Microsoft's shift to a Chromium-based browser as well, maybe there's something there. While it may be the past as far as development, Microsoft doesn't plan to end mainstream support until at least 2021 and extended support until 2026. Windows 10 LTSB 2016 Build which has IE Built IN. Yep. Microsoft keeps things around for a long, long time -- a la XP, etc. I didn't realize that there were any versions of Windows that don't still have IE hiding somewhere. It would certainly be possible to build an add-on for IE, but it would mean not doing a long list of other things in the mean time. Any effort we put toward that would not benefit anything else (contrast with our other extensions, which can work in multiple browsers with only minor modification). There are a lot of features we want to build that could benefit any 1Password users on Windows, not just those using a specific browser. If we can get Auto-Type working well, you may not even care anymore that we're not going to build something just for IE.